Thank You for a Fantastic 12th Annual Run for the Son! Thanks to all of our sponsors, runners, and volunteers, our 12th Annual Run for the Son 5k was a huge success! The race was held on Saturday, May 5th at First United Methodist Church and sent runners on a scenic tour of Downtown Ellijay. Alex Stolz and Naomi Coombs were the overall race winners. 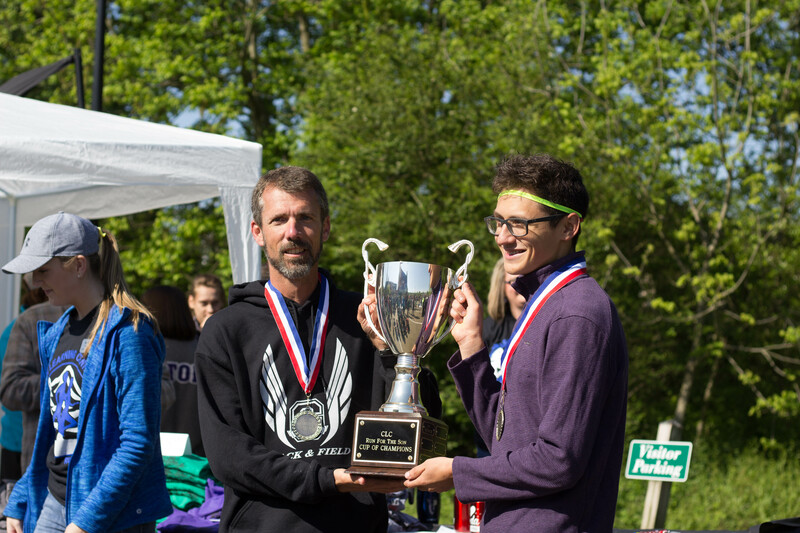 The Cup of Legends trophy for the team with the most registered runners went to Pleasant Grove Baptist Church and the Cup of Champions trophy for the most active participants went to Ellijay CORE Fitness. For full race results, please click here. We are so thankful to all of the Sponsors and Volunteers that made the 2018 Run for the Son possible. Without these generous businesses and individuals, neither the Run for the Son nor our ministry as a whole would be possible! Thank You for an Amazing 11th Annual Run for the Son! Clear Creek Middle School’s team lead by Tommy Jones accepted the Cup of Champions Most Active Participants trophy in honor of Doris Sanford. The 11th Annual Run for the Son 5k which was held on May 6th, 2017 was a huge success thanks to all of our Runners, Sponsors, and Volunteers. Luke Stolz and Denise Hoek were the overall race winners. Clear Creek Middle School took home the Cup of Champions, the trophy awarded to the team with the most active participants on race day. The team accepted the trophy in memory of Doris Sanford. Pleasant Grove Baptist Church accepted the Cup of Legends, the trophy awarded to the team with the most registered participants. We are so thankful to all of the Sponsors and Volunteers that made the 2017 Run for the Son possible. Without these generous businesses and individuals, it would not be possible to put on events like the Run for the Son or to minister to the students of Gilmer County. Candra Warren, State Farm Ins. Ace Hardware & Furniture Co.
David Spivey’s Body Shop Inc.
We are so grateful to everyone who sponsored our race this year. Our supporters make the ministry at CLC possible. Because of the businesses, organizations, churches, and individuals who support the 5K, our yearly banquet, and provide vital monthly support, we are able to serve the students of Gilmer County. Your prayers and sacrificial giving make an eternal difference. We are excited to be starting our 5th grade class in August and are progressing on our Clear Creek facility. Please join us in thanking our sponsors for supporting our ministry and making a difference in the lives of teens in Gilmer County. Thank you! Run for the Son 2016- A Huge Success! We want to thank everyone who came out to our 5K Saturday, May 7th. It was such a fun day and such a blessing for our ministry. We are so grateful to our sponsors. These businesses, organizations, and individuals enable the CLC to continue to minister to the teens of Gilmer County. It is because of your generous support that we are able to have our 6th grade program, teach more students in our high school classes than ever before, and begin long-range planning towards classes at CCMS. Please thank our sponsors when you visit their businesses. They make a huge difference in our ministry. Thank you to all who participated int the event! We had roughly 345 runners, walkers, and phantom runners, making this our biggest race ever! We had a huge response with our team challenge this year. We want to congratulate Team Pink Fitness who came in 1st place winning the Cup of Legends with 42 team members. Thank you for helping make our race such a huge success! We also want to thank Pleasant Grove Baptist Church who came in 2nd place winning the Cup of Champions with 39 team members! Race results are up! Check out the Race Results Link HERE to view your time! Hwy 515 Auto Auctions Inc.
Mr.P’s Take Out Food Inc.
Cartecay United Methodist Church Charles Edmondson Ins. Agency, Inc.
Danny Hall’s Tree Service & Hardscapes, Inc.
Cantaberry Restaurant Clark & Clark Attorneys at Law, P.C. Phantom Runners: $25 before before 4/29 Receives a shirt but does not run. Run as a team! The team with the most participants this year will receive a prize! Stay tuned for more details! 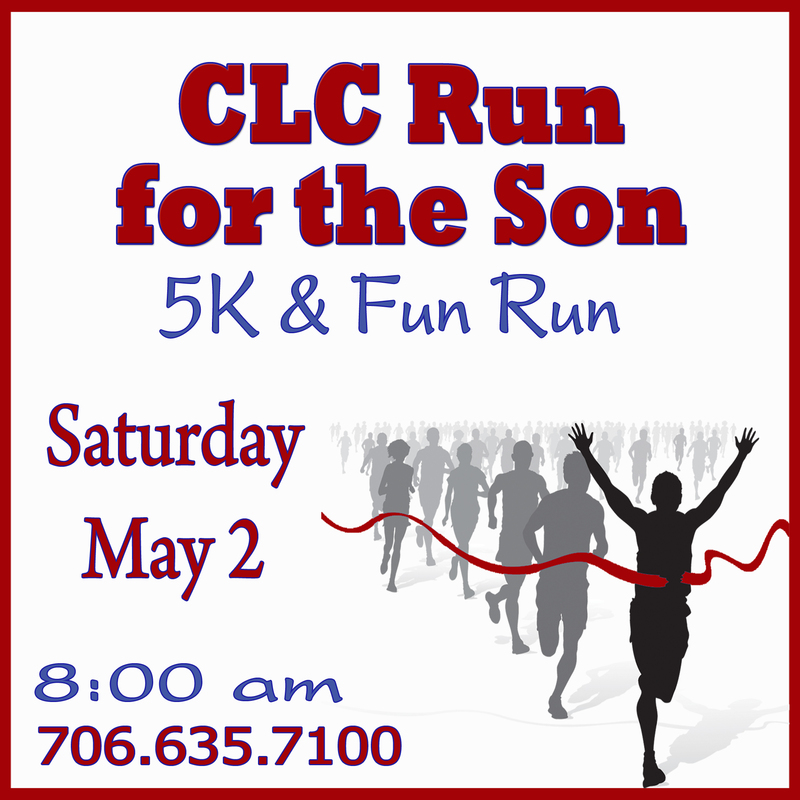 or print the CLC 5k Registration Form 2016 and mail it to P.O. Box 471 Ellijay, GA 30540 by 4/29. Great finish line food and fellowship Door prizes after the Race! Thank you for considering sponsoring our 10th annual Run for the Son-5K and Fun Run. All proceeds go to offer free Bible classes to public school students as well as counseling and mentor programs at no charge to students and families. 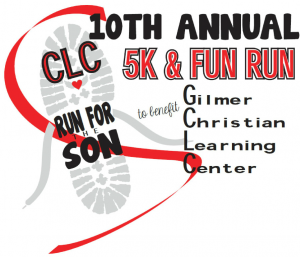 Our 5K is an opportunity to raise awareness about CLC and to raise funds so that we can continue helping students and families and expand our programming. We have served over 5,500 students in the past 31 years! God has blessed us and we want to continue to glorify His name for the next 30 years! Run for the Son ’15 – A Huge Success!! We want to thank everyone who came out to our 5K Saturday, May 2 and ran, walked, and volunteered. It was such a fun day and such a blessing for our ministry. We are so grateful to all the sponsors who made the event possible. 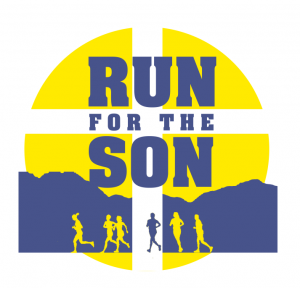 Run for the Son is one of our largest fundraisers. The race, banquet, and monthly donors make CLC possible. We are not funded by the school and do not receive government support so we rely on your generous donations. We were very blessed to have such amazing sponsors this year for our race. Please make sure to thank our sponsor next time you visit their business! Our Run for the Sun was the most successful yet! We had almost 160 racers participate in the 1 mile fun run and the 5K!! Our racers loved running through the new downtown location and the new set up at the First United Methodist Church. The first person to cross the finish line was local track coach Tommy Jones with a time of 17:49. Luke Stoltz was seconds behind him and their competition helped make the race very exciting. Everyone had a great time! Thanks our 2015 Race Sponsors! Candra Warren: State Farm Insurance Co.
HWY 515 AUTO AUCTION, INC.
Marvin Chance/ R. L. Jennings & Assoc. Five Fifteen Building Supply, Inc.
Logan Life & Health Insurance Agency , Inc.
Phantom runner: $20 (before 4/26)-receives shirt but does not run. or print the 2015 Registration form and mail it to P.O. Box 471 Ellijay, GA 30540 by 4/26. *Great finish line food and fellowship! *Door prizes after the race! 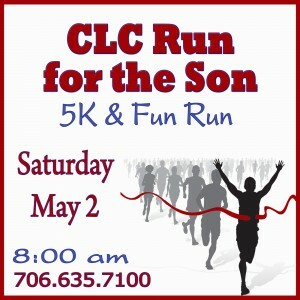 Thank you for considering sponsoring our 9th annual Run for the Son – 5K. All proceeds go to offer free Bible classes to public school students as well as counseling and mentor programs at no charge to students and families. 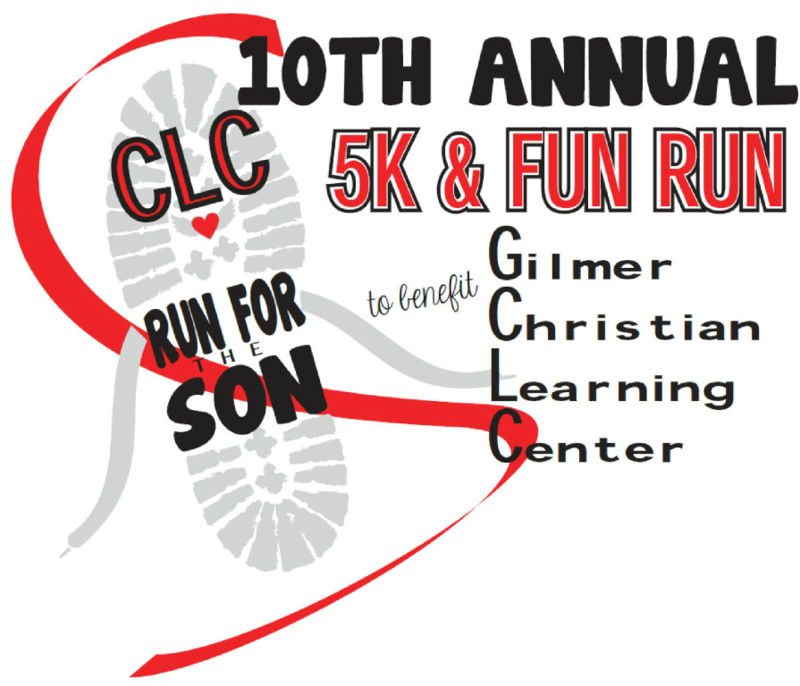 Our 5K is an opportunity to raise awareness about the CLC and to raise funds so that we can continue helping students and families and expand our programming. We have served over 5,000 students in the past 30 years! God has blessed us and we want to continue to glorify His name for the next 30 years! Thank You 2014 Run for the Son Sponsors! Thanks to everyone who made the 2014 Run a great success! Thanks to our 2014 Race Sponsors! The race is part of the 2013 Black Bag Race Series and the Run and See Georgia Grand Prix. Shirts are guaranteed to those who pre-register and will be given out while supplies last to race day registrants. There will be door prizes awarded after the race and plenty of fluids and snacks. Awards will be given to the Overall Male/Female and Masters Male/Female. Age Group awards will be 3 deep in 5 year age groups beginning with 10 and under to 75 and over. Finish line management and results provided by Classic Race Services with results posted to www.classicraceservices.com, www.active.com, www.runningintheusa.com and www.coolrunning.com. 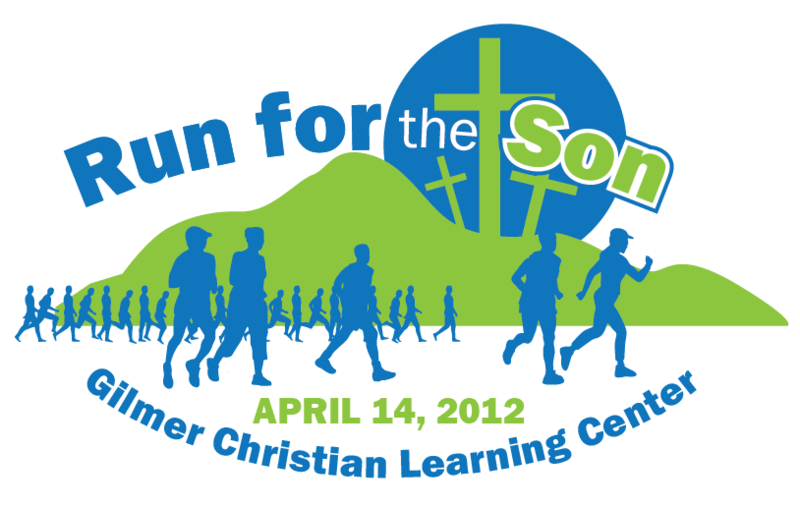 The 2012 “Run for the Son,” held on April 14, was a great success. Tommy Jones won the men’s race for the fifth time in a time of 18:50. Trina Spanelli won on the women’s side in a time of 22:40. The men’s masters champion was Robbie Cheatham in a time of 22:17 and the women’s masters champion was Denise Hoeck in a time of 26:44. Click here to view the pictures from the event! 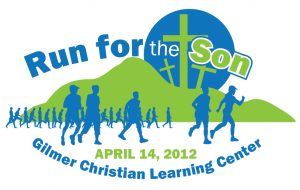 The 2010 “Run for the Son” was a great success! Former Atlanta Marathon winner Gabriel Helminger set a new course and race record with a time of 16:09 for the 5K race. 2 Time Champion and local favorite Tommy Jones finished second with a respectable 17:40. Rachel Riddle, Gilmer High School running phenom won the Women’s Race with a time of 20:12. Her GHS teammate Whitney Reece was the second lady across the line with a 22:27. We look forward to seeing you all back in 2011!